"I've been perfecting this recipe for over 10 years. Melting just a little cheese in the sauce adds great richness without overwhelming the tomatoes. And it's easy to keep these ingredients stocked in the house! Makes for amazing leftovers!" Heat olive oil in a large Dutch oven or heavy pot over medium heat; cook and stir onions for 5 minutes. Add garlic and cook, stirring occasionally, until onions are translucent, about 5 minutes more. Mix petite diced tomatoes, diced tomatoes, white wine, tomato paste, oregano, salt, sugar, black pepper, red pepper flakes, and bay leaves into onion mixture; reduce heat to low, cover Dutch oven, and simmer, stirring occasionally, until flavors blend, about 1 hour. Remove Dutch oven from heat. Add 1/2 cup Pecorino-Romano cheese, basil, and parsley into into sauce; stir until cheese melts, about 5 minutes. Discard bay leaves. Sprinkle remaining cheese over sauce when serving. Turn an abundance of tomatoes into delicious canned tomato sauce. It's almost better the day after. Make it the day before and heat it up for company! This recipe is also very forgiving. 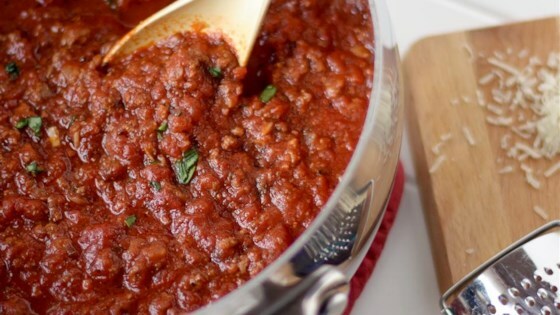 It's the perfect starting point for all kinds of tomato sauce experimentation (add ground beef, add sausage, serve over chicken cutlets, or try different cheeses or herbs, etc). This is an excellent sauce. I followed the recipe exactly, except used crushed rather than diced tomatoes and less olive oil. Straightforward and delicious. Nicely balanced. I didn't change a thing. Very flavorful and thick. Tastes old school, Italian like my Sicilian neighbors used to make in high school. Loved it... even my picky teenagers liked it. Excellent sauce! Easy to make and I only eliminated the crushed red pepper. I did not have any! Oops My men loved every bite of it. It was super easy and super good. Didn't last long as all three batches went quickly and I had three requests for the recipe. Added a rib of chopped celery and a chopped carrot for sweetness. Excellent sauce to add meat to.